Red-toned vintage rugs unite the open dining and living rooms. All the original woodwork in Douglas fir remains. 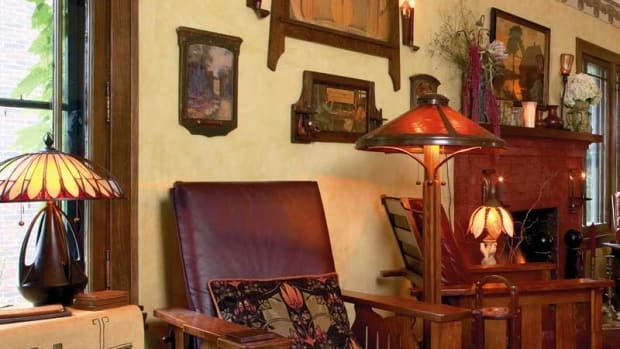 Every nook and cranny is filled with Arts & Crafts-era objects collected since 1989. The green chandelier in the style of Tiffany is a 1960s reproduction by Schlitz Glass. 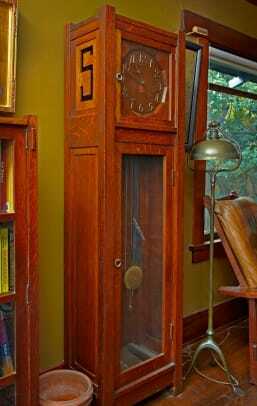 Beyond its substantial array of known works—the Stickley tall-case clock, a drop-light by Tiffany, Rookwood pottery—this house teems with remarkable and rare treasures by lesser-known artists and crafters. Paintings are hung everywhere—everywhere! Is it a museum, an art gallery? Certainly it’s a feast for the eyes. 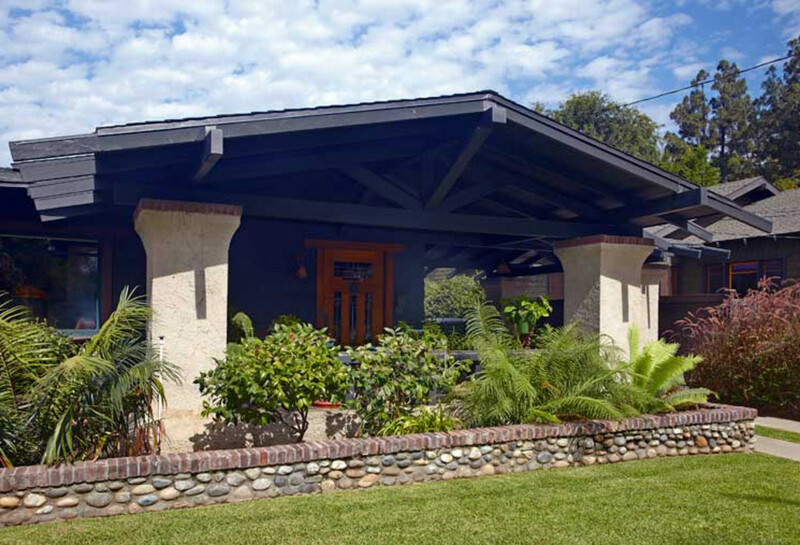 Built in 1910, the bungalow is in Pasadena’s Madison Heights neighborhood. 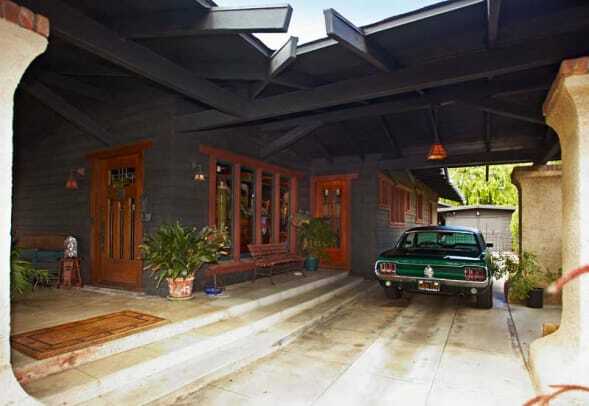 When Chuck Mauch bought this 1910 bungalow in Pasadena, woodwork in Douglas fir and numerous built-ins remained—but all of it, and even the fireplace, had been painted. “Stripping all that paint was one of the worst jobs I’ve ever done,” he remembers. Today the interior glows with the patina of the old wood and period colors. The main living space is arranged in an easy L shape, with rooms united by ceiling beams and woodwork, throw rugs, and a soft glow from vintage lamps and the picture lights over paintings. The fireplace (tile unknown) anchors a room rich with collections. Owl andirons are period; the chair is Limbert. 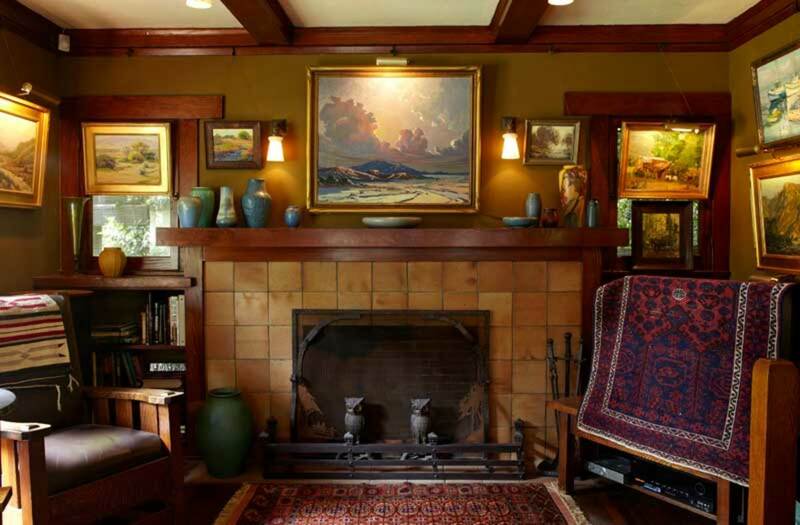 The oil painting over the fireplace is by Howard Arden Edwards, 1937. The architecture is striking. A wide porte-cochere leads down the driveway to the garage. Supported by substantial stuccoed pillars, it meets the front porch by way of low, wide steps to create a usable covered room. Outside, shingles had been painted light gray, and the trim was white. After extensive restoration to the siding, Chuck gave shingles and trim a darker color in keeping with the bungalow period. The exceptional “experience” of this house comes from the combination of architectural detail and layer upon layer of furnishings. Vintage collections include work by lesser-known people whose style, skill, and artistry are on par with the most famous names. Chuck’s thorough knowledge makes a walk through the house a delightful show-and-tell. 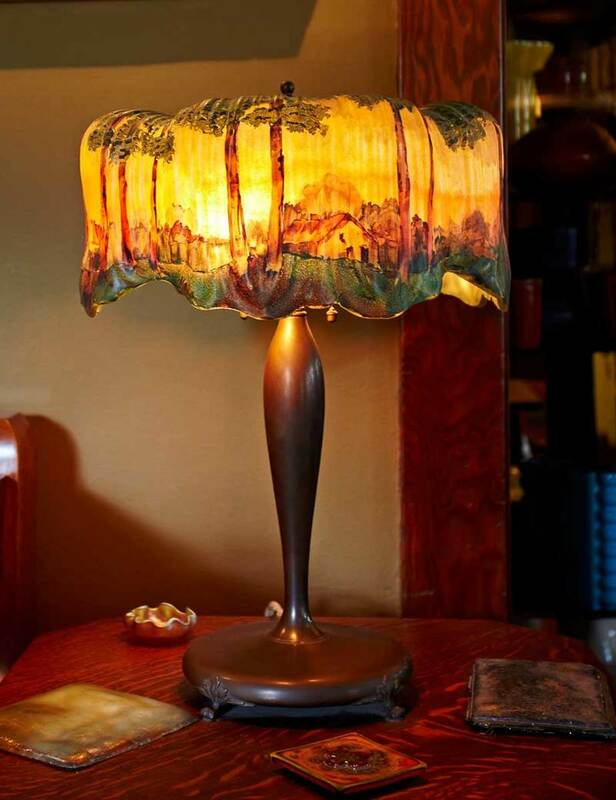 Take, for example, the Pairpoint scenic reverse-painted lamp with a Chesterfield shade—Chuck’s favorite piece. Or the rare floral tile created by Helen Greenleaf Lane, one of only a few signed by the artist. Commanding attention in the living room is a strikingly large, Asian-themed painting (ca. 1930) by Bertha Lum, who was known for her woodblock printmaking. A singular piece, it’s Lum’s only known oil painting. The bungalow brought Chuck Mauch another treasure: his spirited partner, Maurine St. Gaudens, who is a fine-arts conservator, author, and curator. 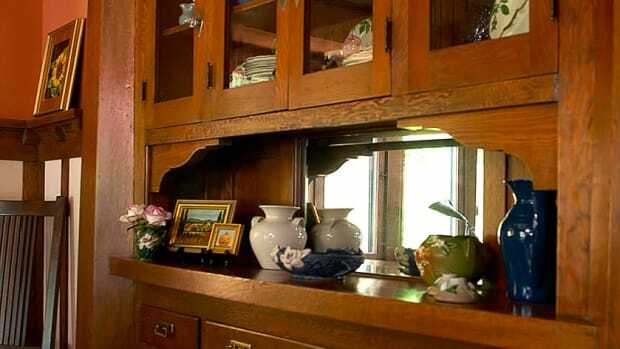 She maintains a separate home but has lent her expertise to Chuck’s “art gallery.” The couple met when Chuck hired Maurine to help appraise and restore his art collection. Their mutual love of artist Samuel Hyde Harris’s work sealed the deal. 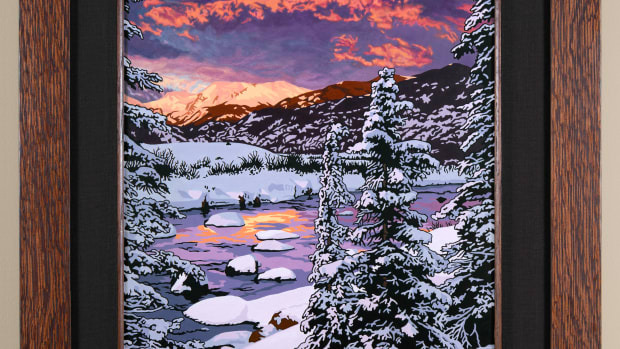 Among his collection of Sam Hyde Harris art, Chuck Mauch’s favorites are train-related commercial color lithographs, most dating to the 1920s and ’30s. The Train Room showcases advertising work Harris did for the Atchison, Topeka, and Santa Fe Railway Company and for Southern Pacific Railways. 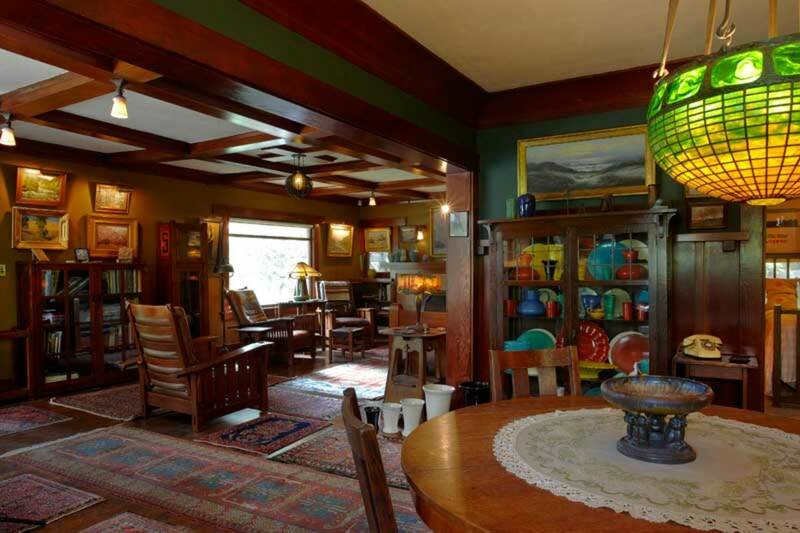 The two have cultivated Chuck’s preeminent Harris collection; this house is a near shrine. 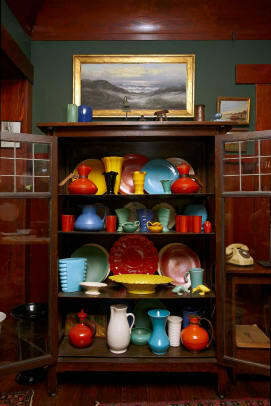 A self-described “fanatic collector,” Chuck owns 79 pieces of Harris’s commercial work and approximately 25 oils, all carefully purchased through auctions, private collections, and the Harris estate. 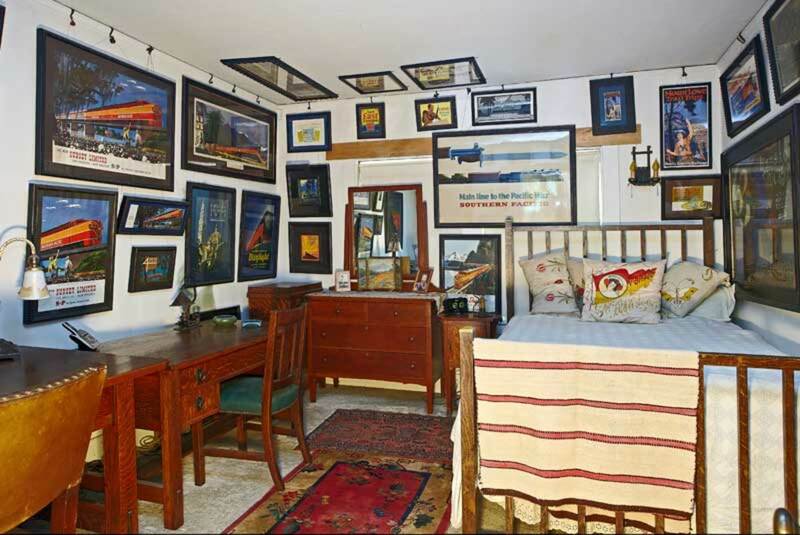 The Train Room—where original advertising posters for the Southern Pacific and Santa Fe railroad lines hang on walls, windows, and ceiling—is a tribute to the commercial work.